Anyone with Gypsy Cobs or other heavy feathered breeds will at some stage have to deal with feather mites. The problem seems to be endemic. The available treatments vary from topical applications of acaricides and insecticides to injections and oral treatments. Some people seem to be able to control mites quite effectively whilst others struggle and seem to always be battling infestations. Last year we had reason to investigate some of the less toxic feather mite treatments for horses. Our stallion Tom was not in the best of health and we had to be careful not to expose him to any more chemicals. Tom had developed neurological symptoms that had life-threatening consequences and sadly, eventually resulted in euthanasia. Tom also had a compromised immune system so he had little resistance to parasites, bacteria, viruses or fungi. That made it very difficult to treat him because we had to rely entirely on substances with little or no known side-effects. Because of the existing issues we did the unthinkable and clipped the feather from his legs to better be able to see what was happening with mite treatments. It’s easier to take skin scrapings and look under a microscope to see what works if you are not having to cope with volumes of feather. We could not give Tom Dectomax injections as it was far too dangerous. We tested legs with different low-toxicity known feather mite treatments for horses and then examined scrapings under the microscope every few hours to observe changes. 1. Areas of scurf / dandruff harbour mites (this is their food source). The scurf tends to be impervious to water and makes it difficult to get any external treatment to all of the skin surface. Not all Cobs have skin that tends to be scurfy. 3. It takes a few washes with a selenium based shampoo to clear the scurf. 4. Straw and hay may contain mites. Click here for more information. These are a different species to feather mites but are just as irritating. If your arms ever get itchy and spotty after handling hay then chances are mites are the cause. 5. Natural pyrethrum as a feather mite treatment for horses (not synthetic analogues – they have safety issues) kills all mites within 12 hours at 40ml / liter of water and must be applied to the whole body. The horse must first be washed and then nearly dry before applying – we used a pump up garden sprayer. We also mixed up 20ml of light paraffin with a few drops of pyrethrum for his ears to be sure we left none of the rotten B’s alive. Cost is about $10 per liter and we made sure he was thoroughly saturated. 6. Extinosad which is an off-label feather mite treatment for horses also kills all mites but takes 24 hours for a 100% kill rate. Spinosad has been tested on various animal species and proven to be extremely safe to use on mammals with a safety margin estimated at 200 times the recommended dosage. Extinosad is a sheep louse and blowfly strike treatment preparation. It’s made from spinosad which is derived from the chemicals found in a species of bacteria that naturally occurs in soils around sugar mills and in sugar cane. Spinosad is also used to treat fleas, mites and worms in dogs and cats but those preparations are much more expensive. The product is also used to treat human lice. Extinosad costs around $90 per liter in Australia and is applied at 5mls / liter of water. Both preparations are extremely safe to use for mammals and birds but care must be taken not to contaminate watercourses as they are detrimental to aquatic life. The environment (stable walls, wooden rails, bedding etc) was not treated to eradicate any feather mite colonies. 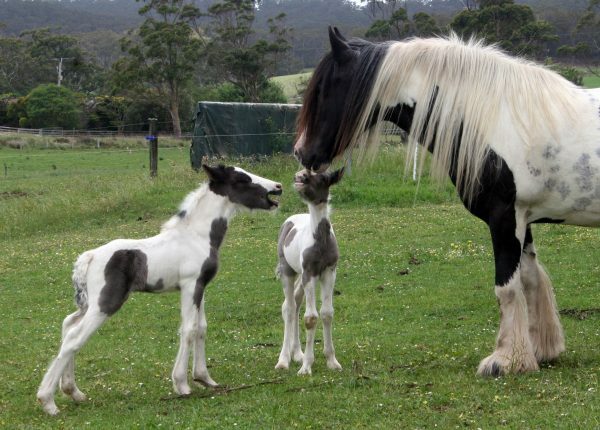 Gypsy Cob twin foals born in Australia. These incredible, rare healthy Twin foals were a surprise birth. Don't worry. We will never use your email for spam. Copyright 2015 · Surrey Springs Gypsy Cobs.